This recipe is adapted from one that appeared in this month's Everyday Food, entitled "Yogurt Waffles." The recipe advised against using quick oats, but they worked fine for me. I substituted vanilla yogurt for plain and forgot the salt. I also didn't have enough eggs to do my mostly whites switch, so this was all fat. Nonetheless, they were great. 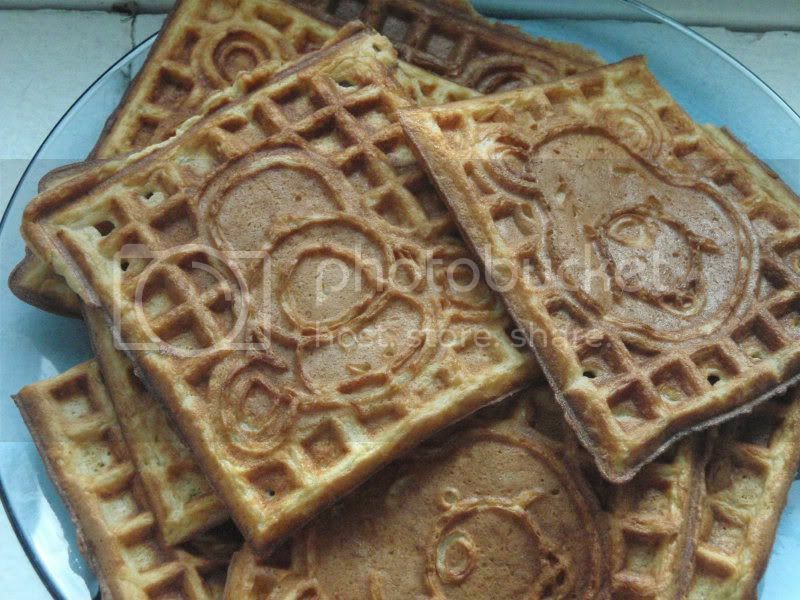 As you can see, I used my Winnie the Pooh waffle maker, so they were tasty and cute! Combine flours, oatmeal, baking powder, baking soda, and salt in a large bowl. Separately, whisk together brown sugar, butter, eggs, and yogurt. Combine wet and dry. Let batter sit for 15 minutes. In a greased waffle iron, cook until golden brown.